There are thousands of aircraft that have been built over the years in order to perform certain tasks. Some of the planes have become famous by them men and women that have flown them. Others remain famous only amongst the true diehard aviation crowd. 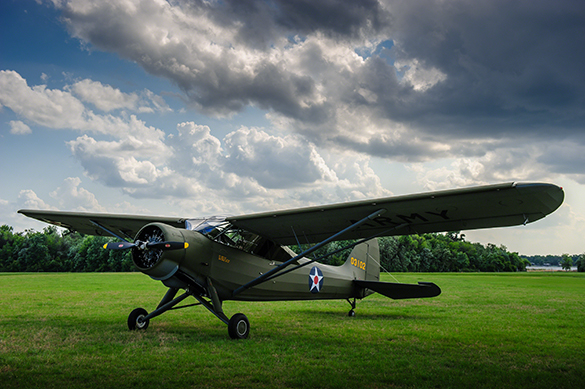 The Stinson L-5 Sentinel is one of those aircraft that served a very important role during WWII but like so many others is often overlooked due to it’s lack of being either a bomber or a fighter. It’s no surprise that the bomber boys and fighter jockeys got so much more attention. Publicity at the time was a crucial factor in keeping the American spirit alive and willing to participate in the fight. That often came at the expense of fantastic stories of bravery and courage amongst those fighting. This little plane has just such a story and it’s one I never get tired of. After Stinson became a subsidiary of Vultee the original HW-75 model, the predecessor of the L-5, was tested as an observation platform. The plane was upgraded from its 75 horsepower engine to an 80 horsepower four cylinder design in 1940 and was redesignated the Model 105 “Voyager.” Six examples were built for the military under the designation YO-54 but failed to meet the necessary performance standards required by the military at that time. The plane was completely redesigned for more rigorous testing. A prototype, model V-76, was built and passed the requirements. It was accepted in December 1942, as the O-62, with a pilot and an observer in tandem seating, which was considered ideal for the observation platform. In 1943 the Liaison category was created and the O-62 was again redesignated the L-5. The planes primary purpose was to courier communications, artillery spotting and medical evacuation. 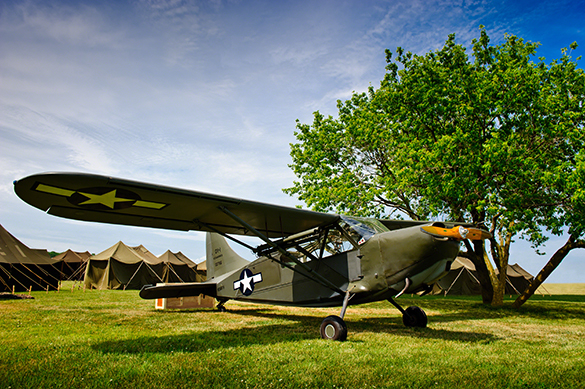 With the ability to take off in short distances, cargo capacity of 250lbs and able to hold a third person if necessary, the L-5 quickly got a new affectionate nickname of the “Flying Jeep.” Between December of 1942 and September 1945, 3,590 were built with the improved six cylinder 190 horsepower Lycoming O-435 engine. 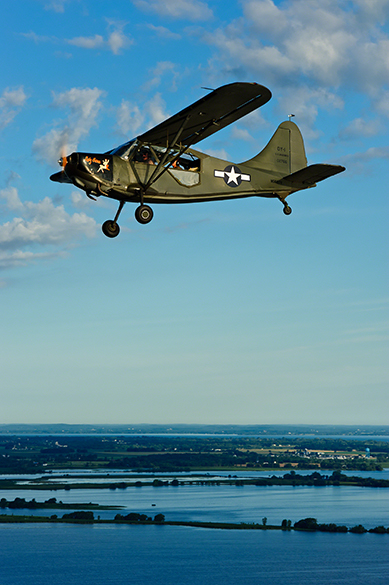 It was the second most built observation platform of the war behind the Piper L-4 Cub. The L-5 became a standard work horse between the front line guys and the behind the scene operators. L-5s would bring medical supplies to forward areas and then return with wounded men. It would observe forward positions and radio them back to artillery positions or to the GI’s about to come under enemy fire. Generals and other high brass officials liked the plane as a transport between bases. The USAAF, US Marines and US Navy used the L-5 in the European, Pacific and Far East theaters in WWII. It was also used in Korea during the Korean War. The roles of this little plane seemed to be endless and thus also was the courage of the pilots who had to constantly fly them. These planes had no guns, had no advantage in a dogfight, they couldn’t fly at high altitude or at high speed. They were constantly under enemy ground fire. Needless to say while the L-5 had an important job it was not an easy job. In 2011 at EAA Airventure Oshkosh, WI, I had the great fortune of meeting Chris and Jerri Bergen, the owners of Lady Satan, a beautifully restored L-5 that had an amazing history behind it. At the time I was working for Warbird Digest and was covering a story on the plane without any real knowledge of it’s history. After initially finding the plane parked outside Warbird Alley behind the reenactors area, I spent much time talking with Chris and Jerry and learned the amazing story of the plane and the pilot. This particular plane was flown by a then 93 year old veteran named Tom Rozga. 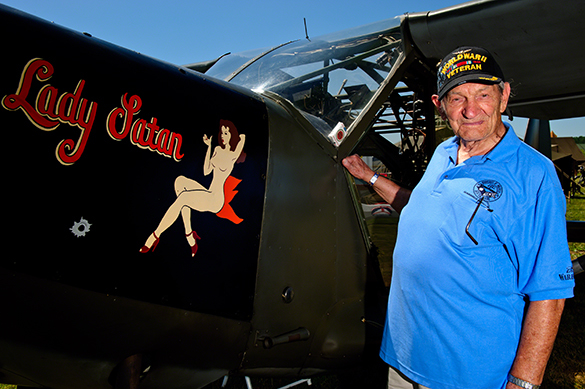 He flew Lady Satan during the invasion of the island of Iwo Jima as a forward observer. Not only did the plane receive fire but the patches can still be seen on the plane today. Chris and Jerri also have the original logbooks that show Tom’s signature along with the date and type of mission flown. Tom was at Oshkosh that year as an honored veteran on the panel. His whole family was there in attendance which prompted a photo shoot with everyone. There was 42 members of the immediate and extended family present for Tom. It was truly an impressive sight. This one little gem in the aviation world is merely a taste of the history that endures today. While not the fanciest, not the fastest, and certainly not the biggest; the importance of what this plane did and what Tom did is unbelievable.